Annie Lynn's Favorite Things: Color of The Year & A Surprise! Color of The Year & A Surprise! 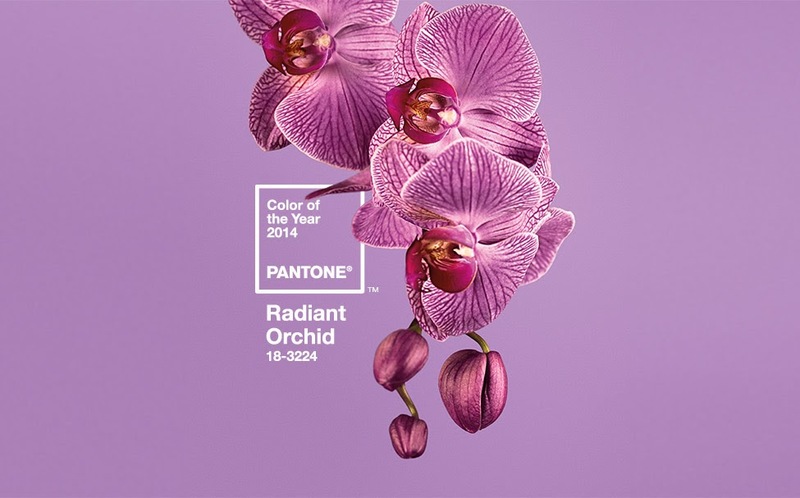 Every year, Pantone selects a "Color of The Year" and this year's selection is "Radiant Orchid" . I have no idea how they go about selecting this, for all I know they could just open up a huge box of Crayola crayons and randomly pick one. But regardless, I LOVE THIS COLOR. Purple has always been my favorite and this particular shade is simply gorgeous. I heard about their choice a few weeks ago and have been excited about it ever since. What I especially love about this color is that it goes literally with any skin tone so it'll be easy to wear for all. It's super versatile and will look great in all types of clothing year-round as well as accessories & home decor. Be on the lookout for this color, I've already started to see it pop up in stores! You can't go wrong with it. Below are a few of my favorite things you can buy in this scrumptious shade as well as a link to Pantone's site right here if you're interested in learning more. Rain boots: I love my Hunter boots in gray, but this pop of color is just what every girl needs to brighten up her spring. Earrings: I don't have my ears pierced, but if I did, you bet I'd be sporting these gorgeous girls everyday. Purse: I covet a Michael Kors tote and when I saw that it came in this color, my desire exploded. Sweater: This sweater will look great paired with chambray as well as statement necklaces in rich jewel tones. Pillow: This pillow's texture is delicious and the color will look smashing in your family room or on your bed. Vase: Target's Threshold line has already come out with a whole botanical collection featuring this color in many of their items, such as this adorable vase. Dress: This orchid colored dress? $11 at Target. Hurry now and grab one. Blanket: Ikea is a magical place that sells this gorgeous throw for only $15. Sandals: As soon as this snow melts, I highly suggest breaking out your colored sandals. These purple ones will be the perfect addition to your collection. Tuffeted stool also from Target's Threshold line. And it has gold accents. Double win. Really struggling to know how to incorporate this beautiful color into your life? HAVE NO FEAR. 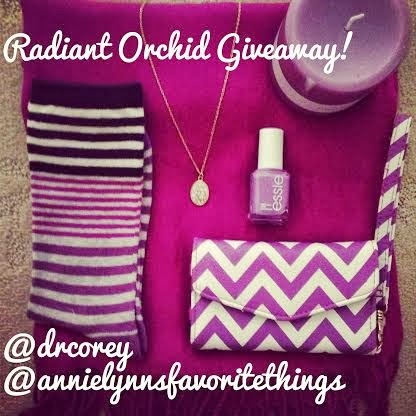 My friend Corey & I are doing a GIVEAWAY on my Instagram account featuring pieces all in radiant orchid! All you have to do is follow both of us on IG, repost the photo, tag us, and use the hashtag #radiantorchidgiveaway. One entry per account, US & Canada only, winner will be announced on February 17th! Will you be wearing this color all year? About To: Go on a hot chocolate (& cake pop) date with my man. Accidentally: Slept with my contacts in. Just Bought: A skirt for $3.